When Dr. Gerald Bronson, Sr. married Dr. Mary W. Bronson and established The Bronson Clinic in 1925, the profession was still in its infancy, only 30 years after the "discovery" of chiropractic. That "discovery" happened in 1895 when D.D. Palmer found that a misaligned vertebra in the spine can have an adverse effect on the nervous system. He tried his idea of manually adjusting a vertebra in the spine of a deaf janitor named Harvey Lillard. The two became witness to what many people considered a miracle. The deaf man began to hear again, and Dr. Palmer began the development of "chiropractic" (translates as "practice by hand"). 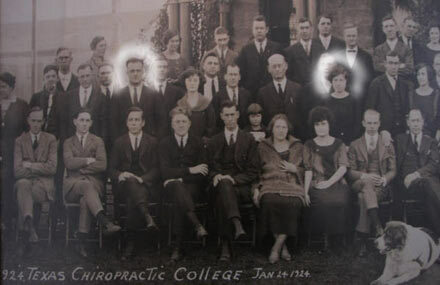 Upon graduation from Texas Chiropractic College in 1924, the early Drs. Bronson ventured out to establish one of the pioneer chiropractic practices. Originally in Ranger, Texas, they soon relocated in 1931 to the big city of Fort Worth, and the clinic became one of the largest in the state, serving up to 80 patients per day. This quite unsettled the medical community. "They're practicing medicine without a license!" they protested. So then the State of Texas (eventually all 50 states) issued licenses specifically to Doctors of Chiropractic. Many influential Fort Worth residents sought chiropractic care and began to speak out for the benefits. They brought their family members in, and recommended chiropractic health care for their friends. The Bronson Clinic began to experience acceptance and a high level of credibility. The second generation Bronson Clinic evolved in the late 1950's when Dr. Gerald Bronson, Jr. joined the practice and soon took over upon the passing of his father. His mother Dr. Mary Winifred Bronson remained on staff and his wife Helen Bronson stepped in as the office manager. Dr. Mary passed on in 1983. Dr. Gerald and Helen retired in 1990. Their son Mark became licensed in 1985 and joined the practice. Now Dr. Mark Bronson has the honor of serving the grandchildren and great-grandchildren of those pioneer patients. He maintains a busy "word-of-mouth" referral practice, and also graciously accepts referrals from many area medical doctors (internal medicine, family practice, orthopedic surgeons, and neurosurgeons), sports team coaches and trainers, as well as other chiropractic doctors for difficult cases. His wife Martha Bronson serves as the office manager and his sister Chrisanne Robertson serves as a chiropractic assistant. The Bronson Clinic, through 3 generations, has provided continuous, quality chiropractic health care to thousands of Texans as well as out-of-state residents for over 90 years. Dr. Bronson’s son Ross M. Bronson is currently studying at Northwestern Health Sciences University and is scheduled to graduate with his DC degree in December of 2019 to become the Bronson family’s 4th generation chiropractor and carry the torch into the 100th year. That will call for CELEBRATION!